1. 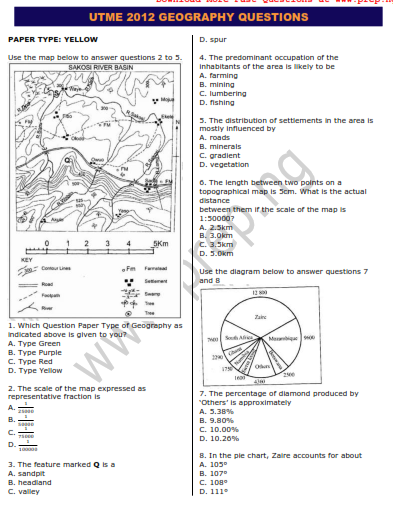 Which Question Paper Type of Geography as indicated above is given to you? 3. The feature marked Q is a ___. 4. The predominant occupation of the inhabitants of the area is likely to be ___. 5. The distribution of settlements in the area is mostly influenced by ___. between them if the scale of the map is 1:50000? 7. The percentage of diamond produced by ‘Others’ is approximately ___. 8. 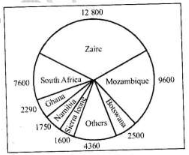 In the pie chart, Zaire accounts for about ___. 9. Chain survey is most convenient for measurements on ___. 10. The earth’s crust consists essentially of ___. 11. The rock type formed through the deposition and compression of elastic particle is ___. 12. Which of the following rock types is formed through the ejection of magma onto the surface of the earth? 13. Rocks that are composed of particles derived from previously existing rocks are referred to as ___. Use the diagram below to answer question 14 and 15. 14. The coral deposits marked M are called ___. 15. The feature marked N is the ___. 16. An ox-bow lake is usually located in a ___. 17. The phenomenon of change in direction of wave fronts as they approach the sea shore is known as ___. 18. The storm which occurs over the China Sea between latitudes 80 and 150 N and S of the equator is a ___. 19. A major characteristic of the tropical continental climate is the ___. 20. Plants that are highly tolerant of drought and can survive in dry habitats are referred to as ___. 21. An important characteristic of the B-horizon in tropical ferruginous soils is the ___. 22. The texture of the soil depends on the constituent of ___. 23. The most significant economic use of ocean water is for ___. 24. The major terrestrial ecosystems are often referred to as ___. 25. Global warming directly results in ___. 26. Accelerated soil erosion results from a combination of ___. 27. Which of the following factors discourages population concentration in an area? 30. Which of the following is mainly associated with tourism? 31. The merging of two or more extensive urban areas results in a ___. 32. Fertile plains are usually characterized by a pattern of settlement referred to as. 33. An industry is optimally located where ___. 34. The lack of access to food in some parts of the world emanates from ___. 35. The standard railway gauge is most common in ___. 36. More than half of the world’s trade is ___. 37. Cane chairs, wooden marks and ornamental brass trays found in Nigeria are products of ___. 38. Petroleum is extracted in Nigeria by ___. 39. In Nigeria, the major products that are taken to the markets from the south to the north are ___. 40. 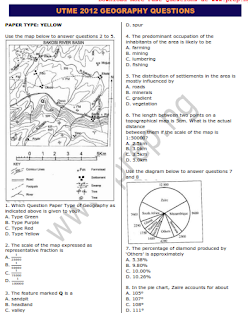 The average elevation of the eastern scarplands of Nigeria ranges from ___. 41. The best method to overcoming natural difficulties in Nigerian agriculture include ___. D. crop rotation, fire clearing and mixed cropping. 42. The Lagos area has emerged as the most prominent destination for internal migration because it is ___. 44. The largest rift valley system in the world is in ___. 45. The Sahel region of Africa is prone to ___. 46. The Algeria’s oil fields are located in ___. 47. The major factors that account for the pattern of population distribution in West Africa are ___. 48. The highest mountain in Africa is found in ___. 49. The two major plantation crops in West and East Africa respectively are ___. 50. The most densely populated river Delta in Africa is the ___.